14ymedio, Havana, 19 February 2019 — The Habana Libre Hotel, an emblem of the Cuban capital and the entire Island, has been converted, lately, into a symbol of the times that are coming. Little by little, the sign with the name of the celebrated lodging place has been losing letters, a deterioration that has not escaped the popular humor, intent on reading a code in the phrase that is left: “”bana Libre,” “na Libre,” “a Libre” have been some of the final variations suffered by the icononic blue lettering. “Now we just need the “a” to drop off so that Cuba can be libre (free) again,” joked a passer-by who stood for several minutes looking up, waiting to witness the moment when “freedom comes,” at least on the roof of the hotel that was managed by the American company Hilton before the Revolution and from where Fidel Castro ruled the country during the first months of 1959, and later, in 1960, the hotel was seized and nationalized. In 2018, the hotel celebrated six decades. With 27 stories and an initial investment of 28 million dollars, the building has gone through moments of light and shadow, years of glamor and others of frank deterioration. But few Havanans remember an image like the current one, with its sign falling apart. The allegory seems appropriate a few days before the constitutional referendum that has filled society with questions and officialdom with fears. The 500th anniversary of the city’s founding will be celebrated in 2019, and that has also contributed to the interpretation of that progressive spelling as a sign of the changes that Cubans are asking for. 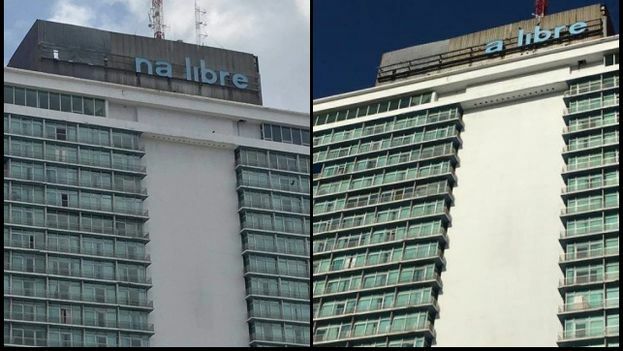 Whether it is laziness or the result of some strong winds, the Habana Libre has once again starred in the photos and selfies of those who expect the uncomfortable letter “a” to fall, leaving only the word “free” on top of one of the most famous buildings in the Cuban capital. Previous Previous post: And If Venezuela Succeeds?